AlleyWatch spoke with Jason Kirby, Chief Marketing Officer about the company’s origins and its most recent round of funding. We raised $4M from Samsung NEXT (formerly known as Samsung Global Innovation Center), Scott McNealy, William Raduchel, and several other Angels and a few investment firms. 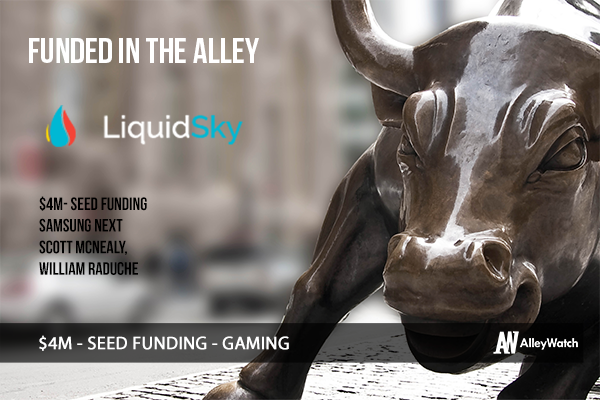 LiquidSky converts any Android, Mac, Windows or Linux device into a high-performance gaming PC. Our servers in the cloud do all the game/application rendering and stream it back to the user all within 30 milliseconds. A lot or people compare us to the fictional company Pied Piper from the show Silicon Valley because we developed a compression algorithm that allows for ultra-low latency streaming. Ian, our founder, felt there needed to be a way for people to rent performance when they needed and not have to spend $1,000’s on the hardware. As a big gamer himself he wanted to make gaming more accessible to the masses without the need for special hardware. Unlike our competitors and the previous attempts at cloud gaming we focused on being compatible with existing hardware so users don’t have to pay for custom controllers or devices. We also provide an ultra-low latency gaming experience from the cloud that can stream to any device at 1080p at 60FPS. Users don’t even notice that the rendering is happening 500 miles away on a server, it feels like their local device. One of the best selling points of our service is that we provide users a full Windows PC in the cloud allowing them to download, install and play any game or app without any compromises. Is the gaming market growing? Definitely growing! It was $91B in 2015 and expected to hit $100B in 2016. Took way too much time. The due diligence by Samsung took 3 months longer than we expected. The due diligence process and crossing all our t’s and dotting all our I’s and showing proof that we did it all properly. We’ve built a technology that can be applied across so many industries that along is reason enough to write a check. It also helped that we are about to hit 1M registered users and have seen revenue growing consistently. Make sure your product is worth funding. Too many startups focus on products that simply aren’t worth VC money. Maybe friends & family or Angels might invest but make sure your business model can survive with less than $1M in funding to accomplish the goals you have set. Releasing a revolutionary product that will shake the gaming industry as we know it.